It is essential for the elderly to maintain a healthy diet and it is not uncommon for this segment of the population to experience a loss of appetite as they age. Not only do seniors experience a slowing of their metabolism and reduction in physical activity, but they may also take medication that affects their appetite or forget to eat because of forgetfulness or dementia. For some, they may eat very little or even nothing at all for a couple of days if given the opportunity – especially when living alone. This is where living in a senior-living community can be an enormous help. Most communities offer dining services with excellent, healthy meal options to ensure that those living there get the nourishment they need. Two to Three Balanced Meals. Senior-living communities include meals prepared by expert executive chefs who create delicious, fresh, and healthy options that the residents enjoy. Depending on the type of community, residents usually enjoy two to three meals each day. Many communities create an atmosphere in the dining room, where residents can relish the camaraderie of others while each meal is served similarly to a fine dining restaurant. Proper Nutrition. As people get older, they become deficient in vitamins and minerals that are essential to proper health, such as Vitamin D and Vitamin B12. Not only do communities provide daily balanced meals, but they also concentrate on ensuring all meals have the recommended amounts of vitamins and supplements. Dining Is an Experience. Communities offer gourmet restaurant-style dining with tableside service. Since residents have the choice of sitting where and with whom they would like, meal times are social times for most of them. It provides a great opportunity for residents to get to know their neighbors better. Chef’s Participation with Residents. 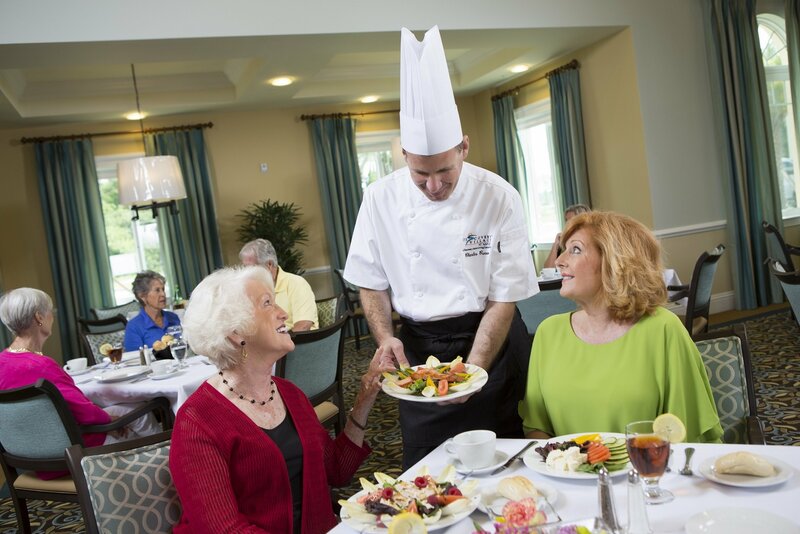 Just like in a restaurant, the executive chef at most senior-living communities comes out before serving to go over the menu and describe each item to entice residents to look forward to their meal. As they eat, the chef also likes to go to each table and talk with residents. Because senior-living communities are close knit, the chef makes every effort to get to know the residents on a personal level. Chef Accommodates Dietary Restrictions. Chefs will prepare meals as healthy as possible by using different seasonings and spices in place of salt and preparing meals that are not laden with fat. For those residents who have specific dietary restrictions, the executive culinary team is usually able to accommodate each meal to meet those needs. Special Meals and Events. Senior-living communities love to host dances, parties, other events and special meals around the holidays. During these times, great care and preparation go into making sure that the food is healthy and nutritious. Food and diet are essential to maintaining optimum health. Independent living communities understand this and work hard to ensure residents get balanced nutrition. Regency Pointe Senior Living offers a program called “Sensations Dining,” which makes everyone feel like they are eating at a 5-star gourmet restaurant, every day.